Having set out from from Potosi at around 11am the stuffy, rickety, old bus made it to Uyuni at around 3.30pm. I nodded off and woke up to the bus painfully crawling up to the top of a hill. On the other side lay a town. A small town, set in a barren, empty landscape. We descended. Plumes of dust followed every vehicle weaving its way through the streets and from nothing, out of nowhere Uyuni rose up around me. One of my first thoughts was that Uyuni felt like a town built post zombie apocalypse. Not because it’s ugly or unkempt (it isn’t), but because it rises from the dry ground with no other town or city for miles around. Slowly to begin with; the outskirts are nothing but a few shed-like buildings and seemingly uninhabited homes. The town then rapidly grows until you reach the central plaza. Only a few minutes on foot and you could be stood in a barren landscape once again. Salt Mountains on the Salar. It is estimated that the Salar contains 10 billion tonnes of Salt, of which, less than 25,000 tonnes is extracted annually. One of my other first thoughts was why are all these cholitas shouting at me? A bus full of tourists arrive and everyone is ready with leaflets advertising trips to the Salar, the Salt Flats. One after the other we get a run down of what the tours include. Bombarded with far too much information after an uncomfortable bus journey we decided to find a hostel and return later. Though, pouncing on tourists must work as we went with the company of the first woman who approached us, two seconds after we got off the bus. The night before our trip to the Salar myself, Israel and Or (two Israeli guys I met at Potosi bus station) went out for dinner. We debated over what to eat. Mexican? No, nothing spicy for 3 days in a jeep. Pasta? Nope, nothing with eggs in it for 3 days in a Jeep. We all settled for chicken, rice, chips and salad. A safe bet I thought. We had been careful to avoid any possibility of a disastrous stomach upset the day of our big trip. I woke up and in a dazed panic, dashed to the toilet. Yep, nothing but liquid. I felt cheated, I didn’t have the mexican or the eggs! Just dry chicken! For the umpteenth time I cracked open the Loperamide. I couldn’t tell you the last time I took diarrhoea relief at home, but here it seems to have become part of my staple diet. A snack to nibble on day to day. Nonetheless, we made our way to the office to begin the 3 day Salar Tour. We made up our group in the hostel to make it a little cheaper and we comprised of 2 Israelis, 3 Germans, 1 French girl and 1 Welsh girl. We were an ensemble of languages; Hebrew, English, German, French, Spanish and of course Welsh. And completely by chance, a great group who got on really well throughout. 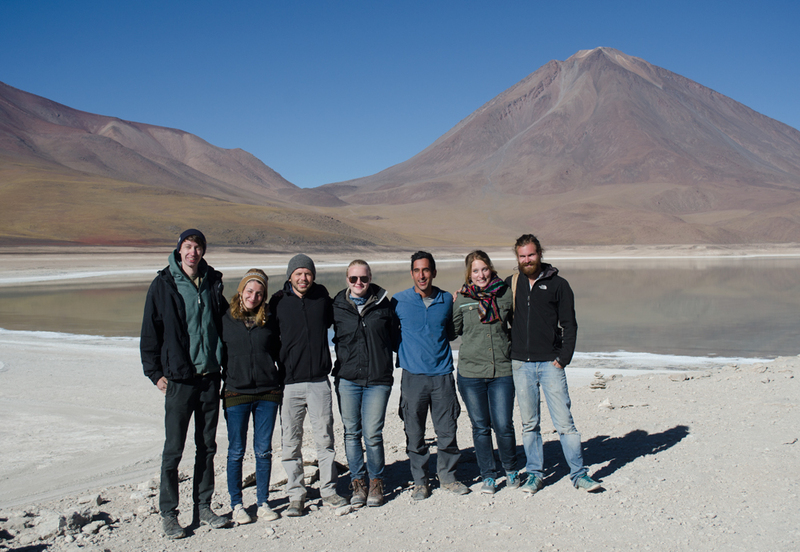 The tour began with Uyuni’s second biggest tourist attraction; the ‘Cementerio de Trenes’. Here, the carcasses of locomotives lay still in a desert land some 3km from the town’s centre. After the collapse of the mining industry in the 1940’s many trains were abandoned here, left to rust and decay. The graveyard now serves as a playground for tourists visiting Uyuni. Adults and Children clamber on the machines to get to the highest point possible as their friends photograph their achievement. And thus, a new profile picture is born! We then made our way over the Salar, with a few stops in small villages on the way, such as Pueblo Colchani. Small bags of Uyuni salt are sold on every local stall. I toyed with the idea of buying a bag to take home but knew that it probably wouldn’t make it back to Wales and instead, Uyuni salt would be lining my bag for the next 3 weeks. After stopping for lunch in the middle of the flats we made our way to the Incahuasi Island. In a barren landscape, practically void of any wildlife of vegetation, this rock rises from the salty ground boasting hundreds of giant cacti. The resilient plants spring up from the seemingly dead rock beneath them growing at a rate of 1cm per year until reaching the impressive heigh of 12 meters. Climbing to the top of the small Island in the burning sunshine is a tiresome task but once at the summit the reward is well worth it. 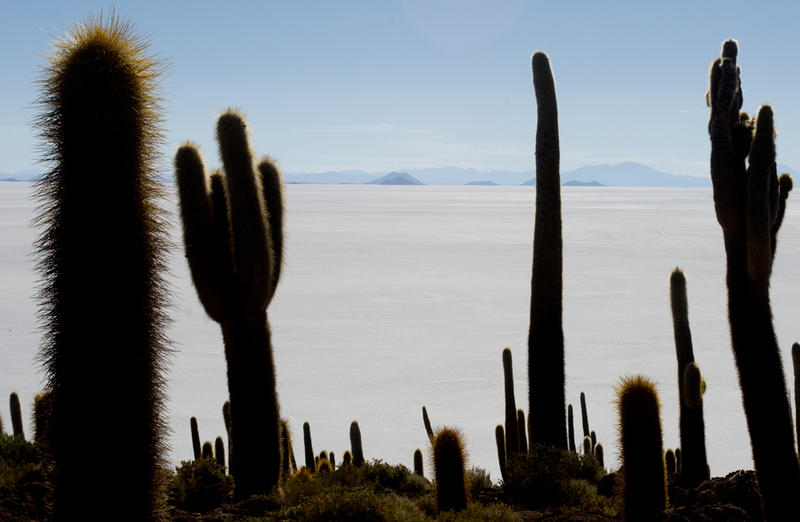 A full 360 degree view of the Salar de Uyuni and 4,086 square miles of salt sprawls out as far as the eye can see. Your eyes struggle to adapt to the blinding expanse of white before them whilst your mind struggles to comprehend the snow like sight in scorching temperatures. If I thought the town of Uyuni felt post apocalyptic it was nothing compared to the landscape that I stood in awe of at the top of the Incahuasi Island. Forever still, frozen for thousands of years the white waves of salt try fruitlessly to lap the shores of the island, just as the waters of Lake Minchin once did some 40,000 years previous. It’s an incredible sight, difficult to put into words and experiencing the vast, barren landscape of the Salar de Uyuni is something that I will never forget. We ended the day at the Hotel De Sol. On the shores of the Salar, the small hotel is used as a base for many of the 60,000 visitors who pass through every year. Sitting outside, as the temperature rapidly dropped, I watched the sun set over the Salar with camera in on hand and a steaming hot cup of tea in the other.